Symptoms: Would not return after playing record. Sound playing out of only one speaker (out of 4 speakers total). As with other Wurlitzers of this era, the trip switch fails intermittently. I haven’t found a source for replacement switches, yet. But with past experience, opening the switch and spraying contact cleaner inside seems to solve the problem. The switch is glued together and to open it requires breaking it open. This is done by inserting an X-acto knife under the edge of the top cover at the opposite end from where the trip wire attaches. Usually about a half inch of the cover breaks away cleanly, allowing it to be re-glued or taped together again. The contacts are directly underneath where the cover is removed. I spray the contact cleaner on the contacts and cycle the switch dozens of times. When playing records, I noticed the pair of top speakers (tweeters) were not working, and one woofer in the bottom was not working, leaving only one speaker that was working. No wonder it didn’t sound very good. Wurlitzer, instead of referring to the right and left channels, refers to them as “A” and “B”. I swapped the speaker leads and determined that channel “A” of the amplifier wasn’t working. At the same time, when moving the “A” speakers to the “B” channel, the tweeter of channel “A” worked fine. So there were two problems with the sound, channel “A” of the amp wasn’t working and the tweeter of channel “B” wasn’t working. I decided to tackle the amp first. I swapped the input cables from the tonearm to make sure the problem was not the cartridge or the tonearm wiring. With my oscilloscope, I traced the signal from the input to the output of channel “A”. The signal was fine until it got to Q6 and Q8. Beyond that point, it was dead. I checked the bias voltage between the base and emitter of each transistor. Q8 was 0.05 volts, which is way below the 0.6V needed. Q6 was 1.2V, which was double the 0.6V that it should be. At this point, since I knew I had a bad transistor and that it would have to cross-referenced and a replacement ordered, I decided to take the amp back to my shop for final repair. Before I removed the amp from the jukebox, I wanted to find out what was wrong with the tweeter on channel “B”. After checking continuity of the speaker connections with the ohmmeter, and checking the coil resistance of the speaker, the only thing left was the 8 uF capacitor in series with speaker connection. I bypassed the capacitor with a jumper wire and it started working. The capacitor is used to block the bass frequencies from coming out of the tweeter. Somehow the capacitor had failed in an open condition. I added this to the list of parts to order. With the amplifier at my home shop, I unsoldered both Q6 and Q8 from the printed circuit board to isolate them so I could test them individually. I checked the base-emitter junctions with the multimeter in “diode” mode. The junctions on silicon transistors should look like a diode, 0.6V one way, open circuit the other way. In the case of Q6, it was open both ways. Definitely bad. Q8 checked OK and didn’t have any shorts between any pins. As usual, with Wurlitzer, it is difficult to cross reference transistors because they used their own part numbers on them. According to the service manual, Q6 is a 130537-5. Sometimes the first place I’ll go looking for a replacement semiconductor is NTE. In this case, I typed in the part number 130537-5 and got NTE289A. The basic specs seemed applicable to the circuit, so I was confident it was a good cross reference. Another source I’ll use sometimes is this page that shows some of the cross references for Wurlitzer transistors. 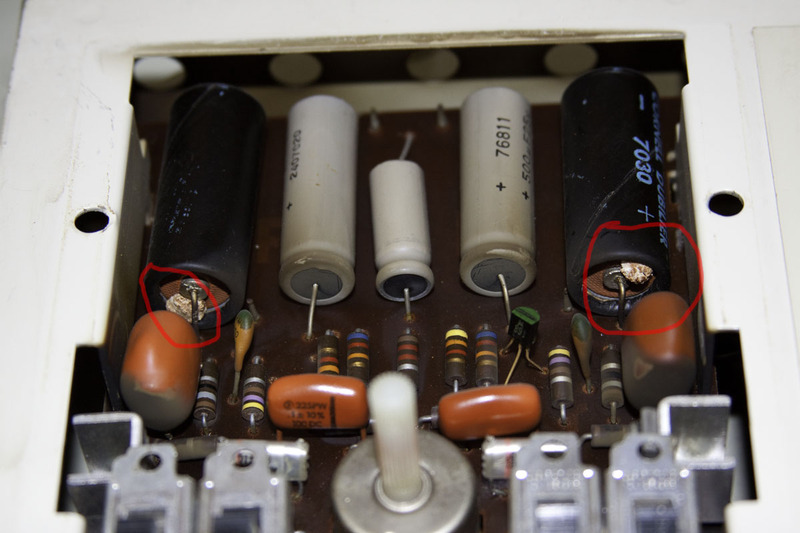 As I was working on this amp, I noticed some leakage on two of the capacitors. Capacitors (C19) on both channels are leaking electrolyte. Click for larger. A lot of people advocate replacing all of the electrolytic capacitors in a solid state amp of this vintage. While electrolytic caps do have limited life, I prefer to wait until there are visible or audible symptoms. The gray caps in the center of the above photo look burnt, but that is just residue from burning dust on some power resistors not shown in the photo. Also, jukeboxes have spent most of their lives in establishments that had a lot of cigarette smoke, which leaves a residue. The two leaky capacitors were replaced. Since the new caps were much smaller with shorter leads, I soldered them directly to the back of the circuit board. With the transistor replaced, the amp works fine.